This billboard has been live in Times Square in New York City since Dec. 24th and will be there for the New Year's Celebration! 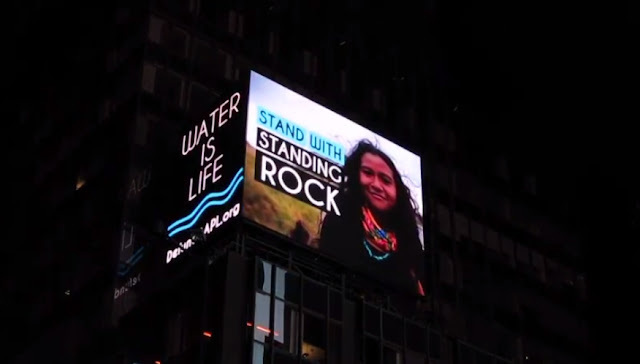 Times Square in New York City became a stage for images of the water protectors. Brilliant signs were held by the protectors with the slogans "Water is life" and "Keep the oil in the soil." After the initial introductions from the organizers, people chanted, “Get up! Get down! Keep fossil fuels in the ground!" and "Street by street, block by block, we stand with Standing Rock!" Water Protectors are expecting that shippers for the Dakota Access Pipeline will terminate their contracts when the pipeline remains uncompleted come January 1. Shippers could legally terminate their contracts if the pipeline is not completed by 2017, which could “effectively result in project cancellation,” according to court papers from the pipeline company, Energy Transfer Partners, cited by The Guardian. When shippers were contacted by The Guardian, they either did not respond or provided vague answers. 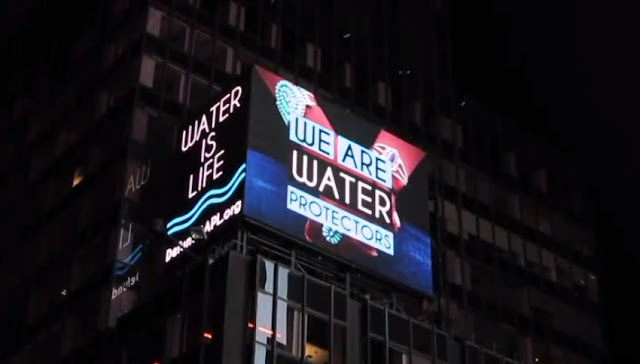 Responses to "Water Is Life: Standing Rock light show illuminates Times Square in New York City"
It's wonderful to get the message out there!